If you have an iPad that is compatible with the Apple Pencil such as an iPad Pro, select “Pencil”. If you’re Pencil runs out of charge or in any way fails or you don’t have an Apple Pencil compatible iPad, you should select “Finger”. Of course, you can use your finger or a stylus. If you won’t be drawing at all and want to remove the drawing palette from the shot area, select “Nothing”. If you draw with the Pencil, you can rest your hand on the iPad without making a mark and you’ll use your fingers to move the script around. If you elect to draw with your finger, scroll bars will be displayed which you will need to use to move the script around. These generally work best when your finger touches them on the half nearest to the script. It’s an Apple thing. Each drawing must be individually marked to be included on the Lined Script. If you generally want all drawings to be shown on the Lined Script and then manually remove any that you don’t want included, select “Auto”. 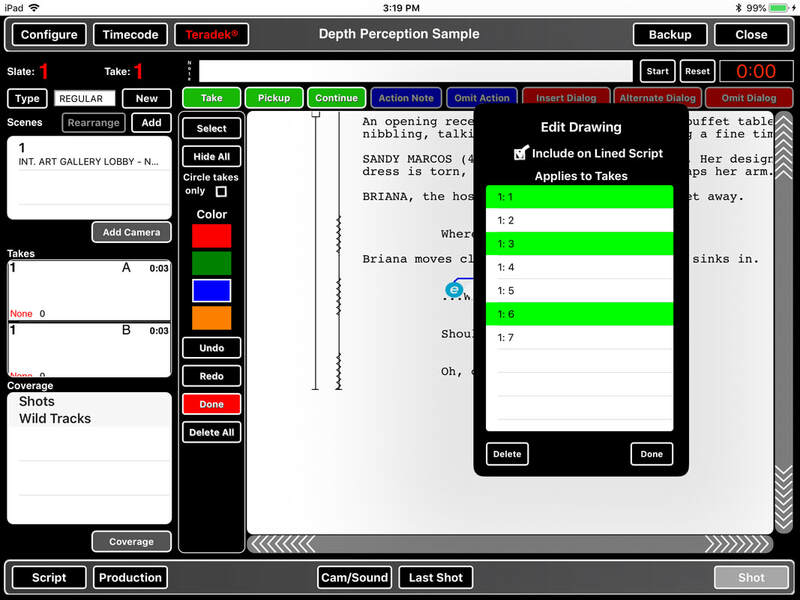 As you create new drawings, they will automatically be marked to be included on the Lined Script. If you generally don’t want drawings to be included on the Lined Script, select “Manual”. If you then want a particular drawing to be included, you can mark it individually. “Print Included Drawings on Lined Script”. If you select “All”, all drawings that are individually marked to be included on the Lined Script will be printed. If you select “Circle Takes Only”, all drawings that have been linked to a circle take and are individually marked to be included on the Lined Script will be printed. If you select “None”, no drawings will be printed on the Lined Script, even if they are individually marked to be included. If a drawing is not individually marked to be included on the Lined Script, it will never be printed. You can preselect three colors that will be shown on the drawing palette so you can quickly change the drawing color. Tap a color block to customize a color. 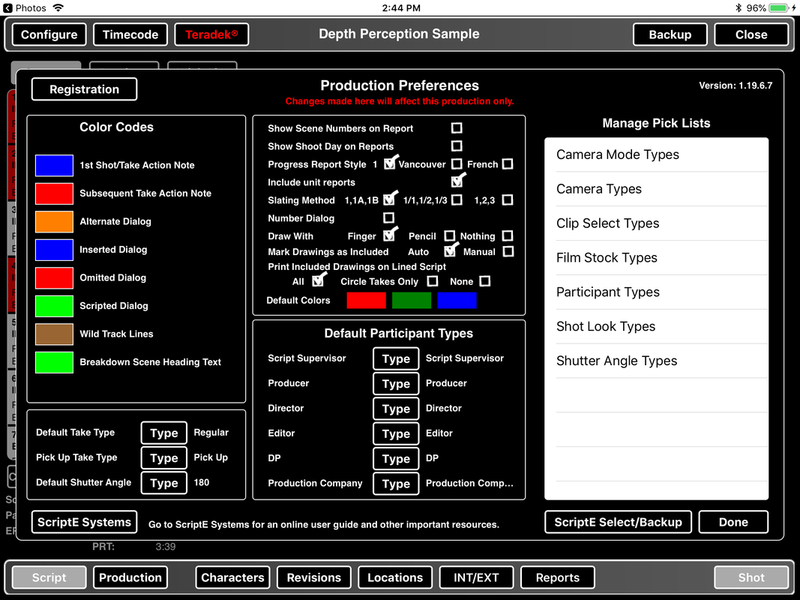 When you open a shot, you will be in selecting mode like you are used to where you can select text in a paragraph then add an action or dialogue note. To switch to drawing mode, tap the Draw button. The applicable buttons will be enabled and, if you are drawing with your Finger, the scroll bars will be displayed. While in drawing mode, tap one of the three preset colors to change the drawing color. The fourth color block allows you to customize a color if you need a color other than the three presets. If you accidentally touched the drawing area or want to remove the last line drawn, tap the Undo button. You can undo all the way back to when you opened the shot. Once you close the shot, all drawings are saved and cannot be undone. If you undo a line that you didn’t mean to undo, tap the Redo button to put it back. You can draw freeform notations or select text in various ways for action and dialogue notes. If you, for example, draw a circle around a word or phrase to select it, the appropriate action and dialogue note buttons will be activated. If you then tap one of the buttons to add an action or dialogue note, the drawing will be removed. It is no longer needed since it was just used to select text. If you circle or use one of the other techniques that are used for selecting text and do not tap an action or dialogue note button then draw something else, the first drawing will remain. You can circle a word or phrase to select it. ScriptE looks for the end of the line nearly crossing over the start of the line to understand that something has been circled so be sure to come close to completing the circle. The words nearest the vertical center of the circle will be selected and only on a single line of text. At the left end of the circle, if you caught all but the first letter of a word, the entire word will be included. At the right end of the circle, if you caught all but the last letter of a word, the entire word will be included. Otherwise, only whole words will be included in the selection. You can also select a word or phrase on the same line by underlining or crossing out the text. Underlining can get a little tricky in that the words below the line could potentially be selected. So, try to keep the underline in the bottom of the actual text. Or, just cross it out if you’re going to add an action or dialogue note since the drawing will be removed anyway. You can select a phrase that extends across more than one line in a paragraph by starting the line on the first word you want to include and ending on the last word you want to include. You can select an entire paragraph by simply starting the line on the first word in the paragraph and drawing straight down to just below the last line. You cannot select multiple paragraphs together so drawing further down the page, won’t select the next paragraph. If you need to insert dialogue, draw a small line between the words where you want to insert the dialogue. If you need to delete a line, mark it for inclusion in the Lined Script, or add it to takes, tap the Edit button. A button with a small “e” will be placed next to each line. Tap an individual “e” button to open the drawing details window. Here you can mark it for inclusion on or remove it from inclusion on the Lined Script. You can also add or remove the drawing from takes that may or may not apply or delete the drawing all together. 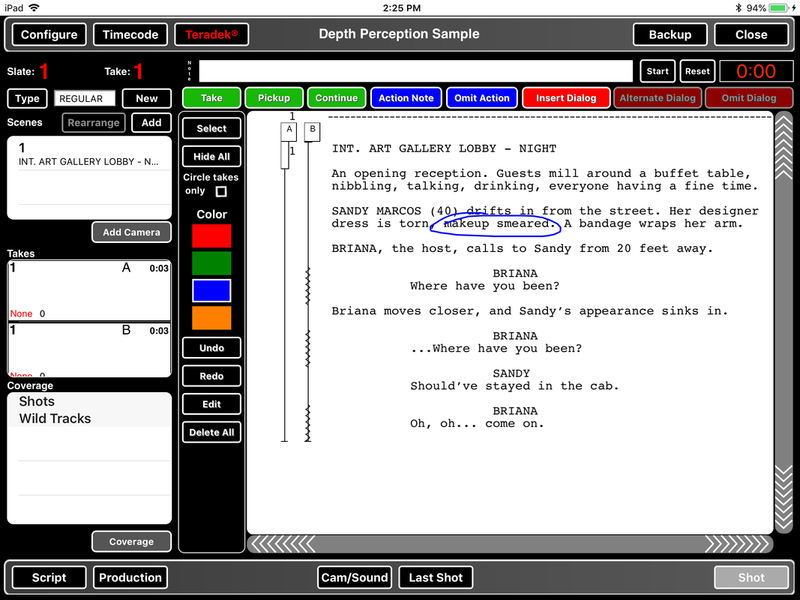 If you draw something after a take has rolled for a shot, the drawing will automatically be linked to that take. You can then select additional takes to which you want the drawing to be linked.